At our house the Sunday Roast is seldom beef. We prefer a Pork Loin Roast . It’s always tender and juicy and the cost is so much less than Prime Rib of Beef. Our version of this Pork Loin Roast includes a stuffing that adds tremendous flavor and creates an extra special dish. This is our go-to Roast for company too and we think once you try it you’ll adopt the recipe. This Stuffed Pork Loin Roast requires minimal butchering skills on your part. Take your time and use a very sharp knife to obtain the result you need. 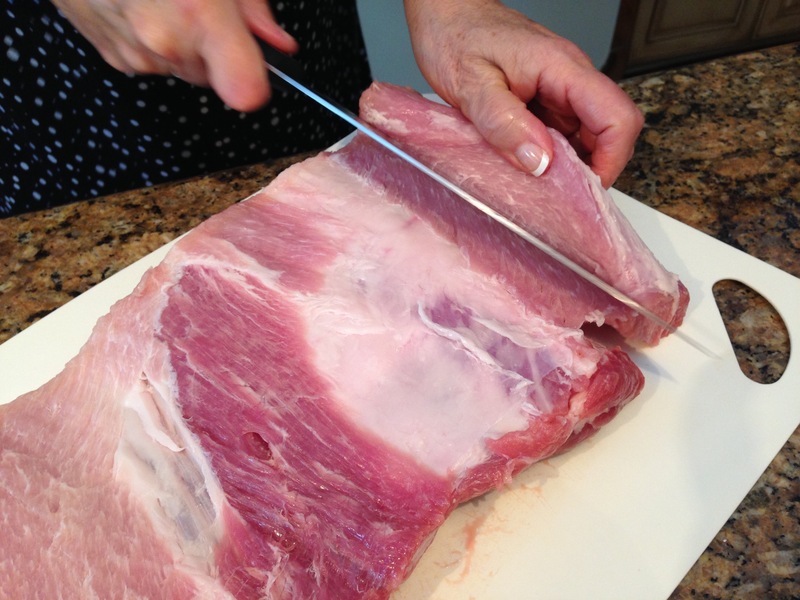 You will be cutting the meat in such a way as to create a flat surface to lay the stuffing on. Then you will tie the roast once again before cooking it. So here goes. We are providing a series of photos to demonstrate how easily this is done. Begin by pre-heating the oven to 400F degrees. 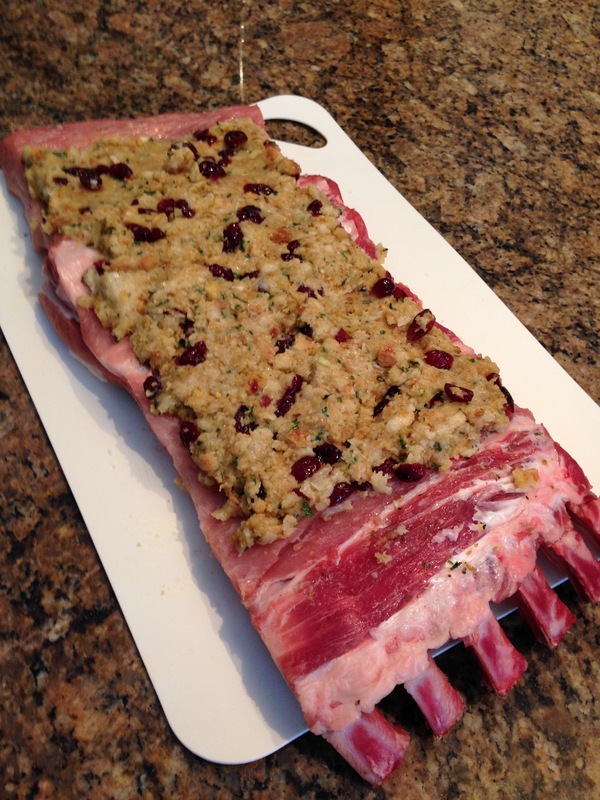 Place the rack in the middle of the oven and line a baking pan with parchment paper. There is almost no clean-up if the pan is lined! 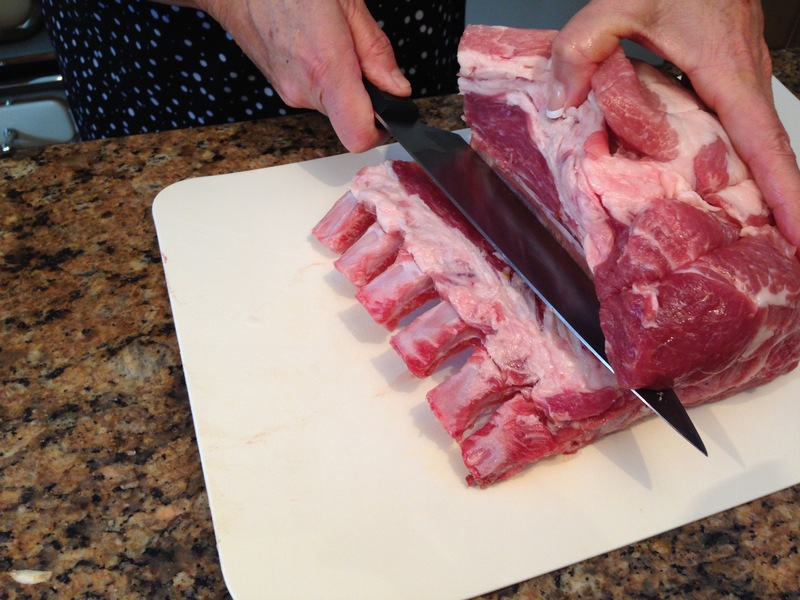 Start with the bones facing down on the board and allow the knife to slide along them to begin. 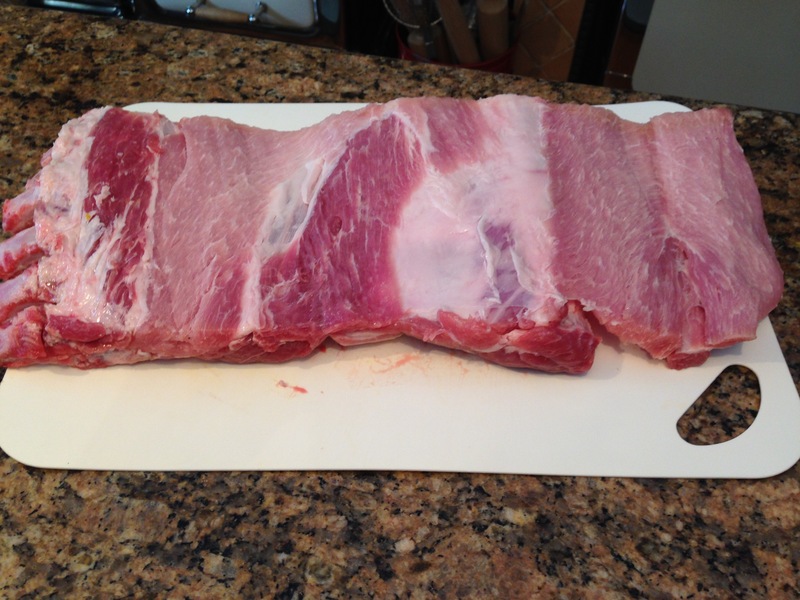 Your goal is to cut through the thick part of the loin to create a flat surface. You are essentially unrolling the loin with your knife. Try to keep the thickness fairly consistent as your cut. Season the meat with salt and pepper. 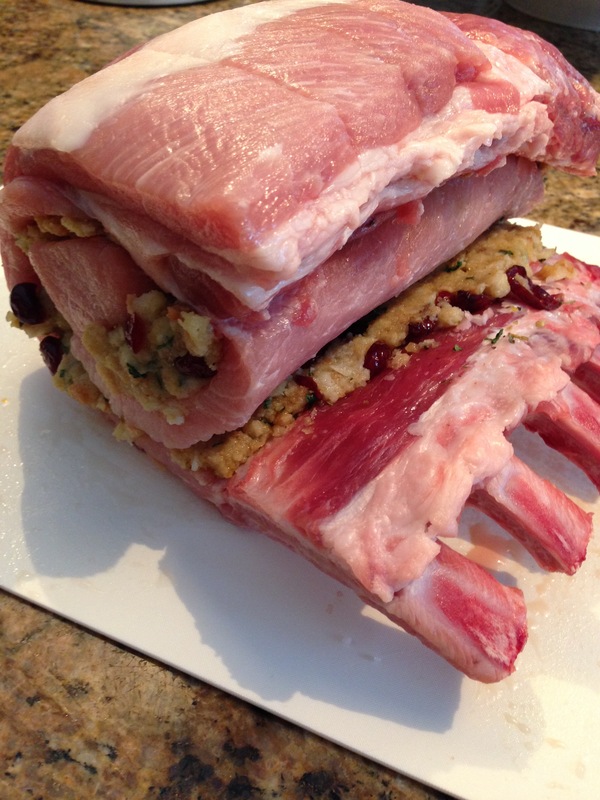 Then spread the stuffing evenly over the open loin. Do not put stuffing within 1 inch of the end of the meat and within 2 inches of the bones or it just squeezes out when you roll it. Roll it up gently. You can use your own stuffing recipe here. You can do bread with herbs and chopped apples, or you can do as we do and use a ready made turkey stuffing and add dried cranberries. We like the taste of “Stove Top Stuffing and its so easy to prepare. You decide what you want to stuff with. 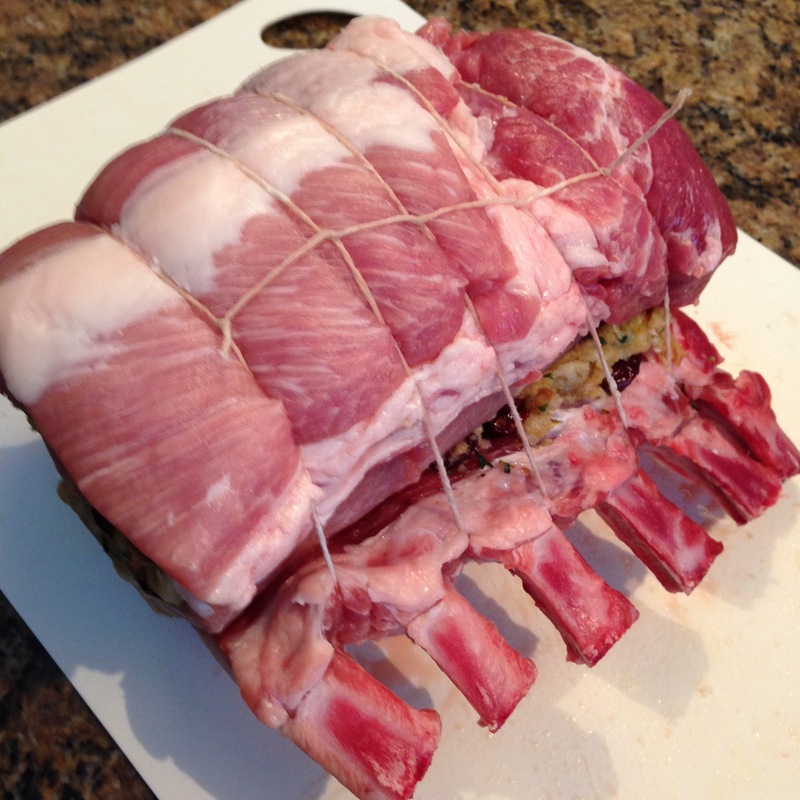 Once you have rolled the loin up, using white kitchen twine, tie it to hold it together. If you have never tied meat as the butcher does, then just bring the string under the roast and tie a knot between each of the bones. We do this technique often so we use the butcher method. It doesn’t matter how it’s done just as long as it holds the roast for cooking. The stuffed Pork Loin Roast is ready to roast. Place it in the 400F degree oven and allow to cook at this temperature for the first hour. Then turn to 350F for the remaining time. This will give you a nice crisp exterior and a juicy succulent interior. 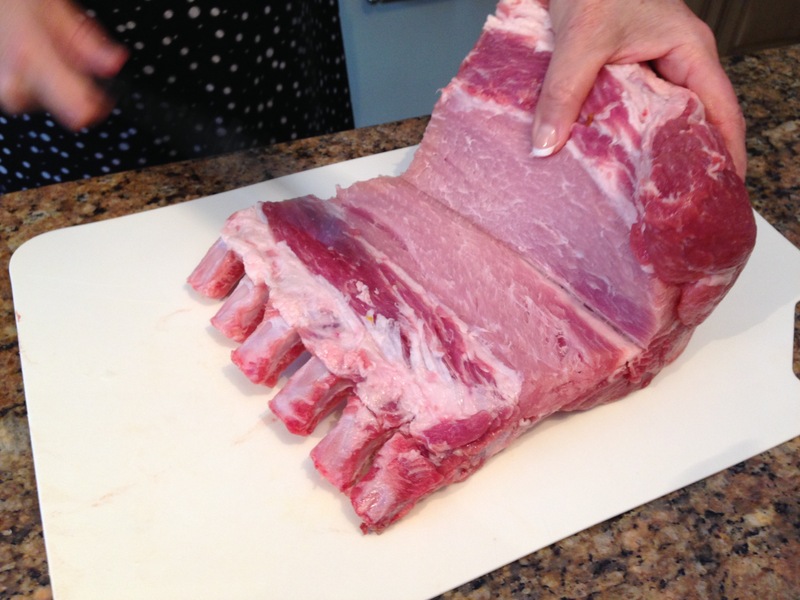 Cooking time will depend on the size of the Pork Loin Roast. We use a meat thermometer to be sure the roast is fully cooked to 160F degrees internal temperature. The Government of Canada has excellent food safety information about cooking and storing meat. Read it here! All that’s left is the eating! Enjoy your stuffed Pork Loin Roast with all your favorite accompaniments! Today we served potatoes with butter and parsley as well as a Winter side salad of Broccoli, Kale and Brussels Sprouts. 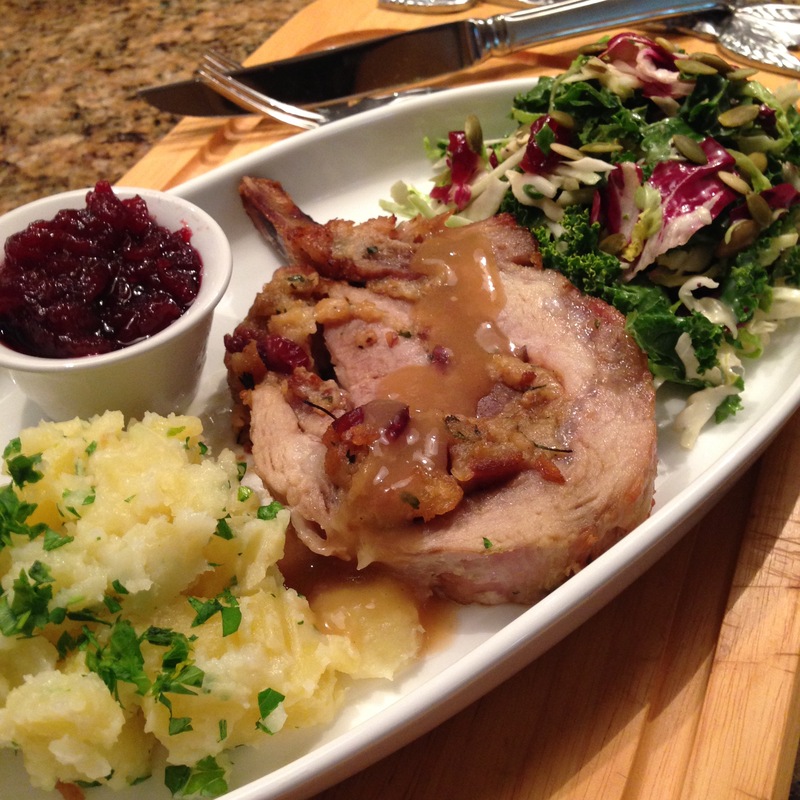 A little Cranberry sauce completes the Stuffed Pork Loin Roast! This entry was posted in Dinner, Meat, Winter and tagged Pork Loin, Pork Loin with cranberry stuffing, pork with stuffing, roast pork, Stuffed Pork Loin Roast. Bookmark the permalink.